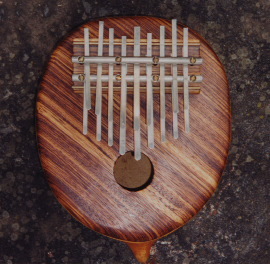 In the West we know this instrument as a thumb piano or kalimba, but througout the African continent it as called mbira, sansa, likembe, malimba, neikembe, or ikembe. It is both a sacred and secular instrument to the Shona, Bantu, Meru, Gogo, and Soga cultures. Used to contact ancestors and tribal guardians, chase away harmful spirits, weather control, cure illness, and impart a strong life force. During the colonial period in Africa the missionaries taught that the mbira was evil and discouraged the use of the instrument, but since independence it has regained its important cultural role to the indigenous peoples of Africa. The Mbira is musically classified in the 'plucked idiophone' group of musical instruments. It has one or more rows of metal keys or tongs mounted on a wood soundboard which is mounted on a dried gourd which acts as a resonator. It is easy to play by gently striking the ends of the keys with the thumbs.